Sears did more than change the way America shopped. It changed America. In its heyday, it was more than just the largest U.S. employer or the country's retailer. It actually reshaped the nation, transforming the average citizen's lifestyle. Of course, the company is struggling now. 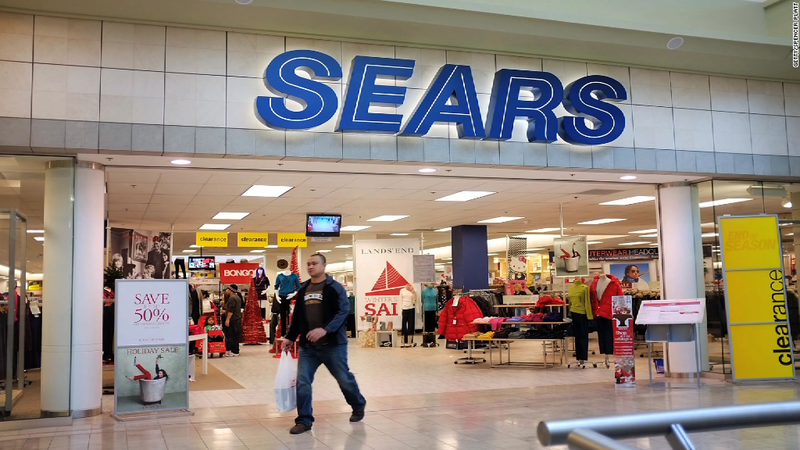 Sears Holdings (SHLD), the company that owns both Sears and Kmart, warned investors late Tuesday that it can no longer promise it will remain in business. It is not in bankruptcy, but it has posted losses of $10.4 billion since 2010, and debt has soared while the value of its stock has tumbled. But if its future is in doubt, its past was very impressive. More than a century before shopping online emerged, the Sears catalog brought a nearly limitless assortment of products into American homes -- homes where people often made their own clothes or furniture themselves or did without. At a time when the majority of Americans lived on farms or in small towns, "it was life changing for many rural Americans," said Amanda Nicholson, professor of retail practice at Syracuse University. And once Americans started to move to the booming suburbs following World War II, Sears stores anchored the malls that helped those suburbs to grow. "You could argue that for a suburb to grow, first comes the water and sewer lines, then came the retailers," said Greg Portell, lead partner in the retail practice with A.T. Kearney. "Sears democratized retail in America." The store made consumer credit widely available, which was a first for many of its customers. That allowed families to buy labor-saving appliances and electronics like washing machines, stereos and TVs that otherwise would have been out of reach. At one point, Sears claimed that 50% of American homes had an appliance made by Kenmore, the Sears brand. "It was the place that people went to furnish their home," Nicholson said. Sometimes Americans even bought their actual homes directly from Sears. Sears's iconic Craftsman houses came with a floor plan and all the materials required to build one. Precut lumber, wallboard and other materials were shipped by rail to the buyer to be constructed with minimal labor. Sears says 75,000 of the homes were sold between 1908 to 1940. As Sears reached to every corner of the country, it also branched out into new businesses that reflected the changing American economy. It started Allstate Insurance (ALL) in 1931, and purchased both the Dean Witter brokerage firm and Coldwell Banker real estate in 1981. It teamed up with IBM (IBM) to form Prodigy, one of the very first internet services, in 1984 and created the Discover (DFS) credit card in 1985. "They had a phenomenal tradition of doing things that were highly innovative," said Nicholson. Sears also became huge. By the 1990's, the company said that one out of seven Americans either worked for Sears, or had once worked there. And these weren't the low wage jobs with few benefits associated with many retailers today. "These were jobs with health care and benefits and pension plans," said James O'Rourke, a professor of management at Notre Dame. "People looked to spend their entire career at Sears Roebuck. People thought there was no limit to the innovation at Sears." It wasn't any one thing that led to its downfall. The rise of discounters like Walmart (WMT) and big box stores like Home Depot (HD) hurt, and obviously so did the onset of online shopping. There were also some bad decisions by Sears management, which never could manage to make the rest of its merchandise as popular as its appliances and power tools. "As with so many things, the market moves on. Tastes change," said O'Rourke. "People said, 'That was fine then, it's not fine now.' When people go into a Sears today, they say 'I can do better.'"